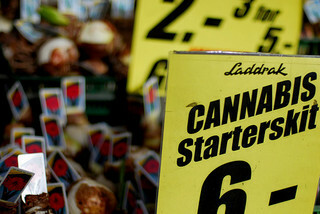 Over the past years alot of half-assed information has been spread by a combination of poor journalism and rumors via social media, which states that foreigners can no longer buy cannabis in coffeeshops in Amsterdam. Though this is untrue, word about an experimental policy in the south of the Netherlands has travelled. Many, both outside and inside the country, believe its only a matter of time before prohibition becomes a national reality. But the truth is, that is still only one of many possible futures for the Netherlands. Beyond that, research and reality shows the experiment is a failure, yet politicians remain locked into their white-washing campaign to clean the image of the nation. My returning guest is Frederik Pollak, a researcher and policy expert who has been following the discussion for over a decade, and has alot to say about what is really going on in the Netherlands and around the world. Oh thanks – I wondered about that…didn’t know it was false. It’s true they’ve been clamping down on squatting and also stopped you buying mushrooms and other things in coffee shops though? Hey Tim.. sorry Im late to respond.. squatting has been outlawed.. last year the policy went into effect. They’ve evicted many many squats. Those that are still around are fighting what feels like a losing battle, in and out of the courtroom. Other things in the coffeeshop> – they banned selling alcohol and weed in the same establishment some years ago. Mushrooms, which were sold in smartshops, certain types have been banned, leaving not much to be sold. Ive noticed most smartshops have disappeared. What a great episode! I grew up in the Lower Rhine Area just about 10 km away from Venlo so drug tourism is a familiar topic to me. I can confirm that it is still possible for non-residents to get membership cards, because a friends showed me his some time ago. The legalisation of cannabis is an old topic in Germany as well even if doesn’t seem to be on the agenda of Merkel’s conservative government. My opinion is that controlled dispensation of cannabis would curtail illegal drug trading, especially because it is the only illegal drug that is beeing consumed throughout all scenes and social levels and therefore the most requested. I can imagine hashish and marijuana beeing sold in pharmacies only. You would have to register once and buy it with a special card together with a valid ID. This way the dispensation of cannabis products could be limited to a maximum amount per week or month. It would also be possible for full aged to register and there should be a high tax on them. Seb thank you! I really enjoy speaking with Mr. Pollak and its fun to revisit someone who is battling in the trenches of government and see how things have changed over the years. I think you’ll really enjoy my next show with a new friend who works in the industry. Sometimes I find the situation reminds me of The Soviet Union in the early days… I know its strange.. but Ive long read there was a disagreement between Trotsky and Stalin (or maybe I have the names crossed) one who felt they should work on the revolution domestically the other felt in order for the system to work it had to spread and be international… sometimes I think cannabis policy would work better if it included all neighboring countries.. and their neighbors. Having only one amongst neighbors with opposite policies seem to be one reason things don’t quite work. Bizarre comparison? probably — but Im sure you know how my mind wanders. Thank you for this great episode! I heard rumors for the last 2-3 years saying canabis will be illegal again in the netherlands, or only allowed for people who live their. A lot of wild storys about the canabis situation in the netherlands are floating around these days. And is is sometimes hard to appraise the current situation in a foreign country if you do not follow it regularly.